LONDON--Technavio has announced the top five leading vendors in their recent global submarine-launched missile market report. This market research report also lists four other prominent vendors that are expected to impact the market during the forecast period. According to the research analysis, the global submarine-launched missile market is highly competitive due to the presence of many global, regional, and local vendors operating in the market. Intense competition, frequent changes in government policies, rapid advances in technology, and environmental regulations are key factors that determine this market's growth. In addition, in-house manufacturing capabilities, product offerings, global footprint network, client bases, and R&D investments are key areas that all vendors focus on to gain a competitive advantage over their counterparts. “Vendors compete with each other based on cost, reliability, product quality, and aftermarket services. Providing cost-effective and high-quality submarine-launched missiles is crucial for vendors' operations, in order to survive and succeed in such an intensely competitive market,” says Moutushi Saha, a lead defense research analyst from Technavio. The report also states that, government organizations such as the US Department of Defense (DoD) and the UK Ministry of Defence (MoD) serve as certification bodies that encourage the development of submarine-launched missile systems. Airbus Defense and Space engages in designing, developing, and manufacturing of space and defense products for governments and other institutions. It operates military aircraft; space systems; communications, intelligence, and security (CIS); and electronics business lines. In the global submarine-launched missile market, Airbus Defense and Space was involved in the development of the M51 and M45 missiles, which are used by submarines of several countries around the globe. Boeing Defense, Space & Security, along with its subsidiaries, engages in the aerospace and defense businesses across the world. The company developed Harpoon, the anti-ship ballistic missiles, which are being used by various submarines of several defense authorities across the globe. BrahMos Aerospace is a joint venture between the Defence Research and Development Organisation (DRDO), India, and the Federal State Unitary Enterprise NPO Mashinostroyenia (NPOM), Russia. The company developed BrahMos missile which has a speed of Mach 2.8-Mach 3 and weighs approximately 6,600 pounds. It can be launched from a ship-based platform, land-based vehicle, or submarine. The air launch of BrahMos is currently being tested and evaluated. Lockheed Martin engages in the production, supply, and R&D of advanced technology systems, products, and services to global defense and aerospace industries. The company developed Trident II (D5) submarine-launched ballistic missile (SLBM), which would be integrated with the Ohio-class submarines and Vanguard-class submarines. Raytheon provides its solutions to the defense and other government markets across the world. The company developed the Tomahawk submarine-launched cruise missile (SLCM), which is integrated with several nuclear-powered submarines such as Virginia-class and Los Angeles-class submarines. BEIJING – The Malabar naval exercise involving the India, U.S. and Japan is designed to "target" PLA (People's Liberation Army) submarines in the East and South China Seas and to back America's Asia-Pacific rebalance strategy, a Chinese media report claimed today. "Such a large-scale military exercise was obviously designed to target China's submarine activities in the East and South China Seas in recent years, promote the U.S. rebalance to the Asia-Pacific and cement the U.S. presence in the region," an article in state-run Global Times said. "Washington brought New Delhi and Tokyo into the exercise to relieve its pressure due to overstretched military presence around the globe and tighten its grip on the Asia-Pacific region," the article said. The Malabar exercise started in 1992 with the navies of U.S. and India in the Indian Ocean. Since Japan joined in 2007, it has alternated between the West Pacific and the Indian Ocean. In June, the three countries held their largest-ever joint exercise which involved 11 vessels and 8,000 personnel. The article said Japan wants to become a permanent member of the exercise to enhance its military cooperation with the U.S. and find a solution to its dispute with China over islands in the East China Sea. Japan, which has participated in the exercise five times, also attached great importance to the Malabar 2016. It used the exercise to enhance the anti-submarine capability of the Japanese Maritime Self-Defence Force and spy on China's military deployment in the waters, it said. "However, the anti-submarine warfare of the U.S., Japan and India won't make them succeed in countering China as China has significantly improved its technologies in ballistic missile submarines and attack submarines. And with the development of multi-dimensional operations, merely elevating anti-submarine capability won't enable these countries to contain China," the article said. "The Malabar exercise has always been led by the U.S., with Japan and India being just partners with varied purposes. This will cripple the actual effects of the exercise. In fact, this kind of exercise is unlikely to impair China's presence in the East China Sea, except for flaring up tensions in the waters and producing frictions," it said. U.S. Navy Engineers Develop Autonomy In A Box? As investments in unmanned undersea vehicles are set to increase in the future, assets beneath the surface must have a reliable avenue to meet rapidly changing mission needs. This is where Autonomy in a Box comes in. Engineers at the Naval Surface Warfare center developed this solution, which will simplify updates to UUV mission information. “Autonomy in a Box is designed to make installing configurations of autonomy software on a vehicle as easy as installing an application from an app store,” Matthew Bays, system engineer, said. This capability will offer a quickly deployable software solution that provides platforms with a basic autonomy capability, supports configuration management of an autonomy framework to facilitate easier experimentation and compartmentalizes autonomy software development, a Navy release said. The release notes that UUVs are currently shared assets between software developers and autonomy projects; step-by-step installations are required before every test of algorithms and operating systems. This process can take days to weeks, with lengthy monetary and mission execution schedule costs. The Autonomy in a Box solution leverages a “Docker software pre-developed ‘container,’” a large file that allows users to package an application into a standardized unit for software development, the release said. Moreover, the file condenses software into a complete file system with everything it needs. Developers can now develop their own Docker container or work with provided baselines. "Any group or program that wants to test their autonomy software can get a copy of the base frameworks within a Docker image and integrate their experimental software off-site into the image," Bays said. "After the copy is returned, the integrity of the software would need to be verified with respect to the changes they have made and deploy it onto our unmanned assets." Similar platforms might be used to perform different mission sets, requiring varying levels of autonomy based upon its mission. The system was tested in October during the United Kingdom’s Unmanned Warrior exercise. The team is also working toward further integration, as well as developing a topside autonomy testing container and creating more advanced auto-detection features. The Pentagon is developing an improved version of the venerable Mark 48 heavyweight homing torpedo. A standard of U.S. Navy submarines since the 1970s, the torpedo is being updated to deal with new threats. The Mark 48 torpedo was originally fielded in the early 1970s as a “one torpedo sinks all” replacement for the older Mark 37. Unlike the Mark 37, which was only useful against other submarines, the Mark 48 could attack both surface ships and submarines. The Mark 48 weighs 3,695 pounds, is nineteen feet long and has a diameter of 533 millimeters. It has a 650 pound PBXN-103 high explosive warhead, an effective range of 35,000 yards, and an estimated maximum depth of 2,500 feet. It has both active and passive guidance systems capable of locking onto targets at 4,000 yards, and can also use wire guidance. The U.S. Navy has 1,046 of the torpedoes fleetwide. Defense contractor Lockheed Martin is upgrading existing Mark 48s to a new standard. A new, upgraded torpedo will run quieter, have an improved propulsion system, be more resistant to electronic countermeasures, and have an all-new guidance control system known as Common Broadband Advanced Sonar System, or CBASS. The new system should allow for locking onto enemy vessels at even longer ranges. In addition to upgrading older torpedoes, Lockheed will deliver 250 more brand new Mark 48s to the U.S. Navy. Britain owns four missile submarines: The HMS Vanguard, the Victorious, the Vigilant, and the Vengeance. They patrol the oceans in order to protect it citizens against a surprise nuclear attack. And while it is reassuring to know what the country does in order to protect the land, the scary part is that each submarine runs Microsoft’s first commercial NT-based operating system installed since 2008. Each marine has up to eight Trident II missiles and 40 nuclear warheads that could devastate entire countries in the case of war. They’re powered by nuclear reactors that could allow them to remain submerged for a very long time as well, with each warhead able to protect themselves against enemy submarines using Spearfish torpedoes. These underwater killers were commissioned in the 1990s. In 2008, Windows XP (branded as Windows for Submarines) was installed on them because it was “cheaper than alternatives”, allowing the United Kingdom to save £22 million. There haven’t been any reported problems, but that doesn’t mean these submarines are safe because Microsoft stopped supporting this operating system in April 2014. Because Microsoft no longer offers security patches for Windows XP for Submarines, the OS is vulnerable to all kinds of viruses. For example, the Iranian centrifuges were infected with the Stuxnet virus which was transferred via USB keys. The United Kingdom must make some serious investments soon in its IT infrastructure. In 2013, EHI Intelligence estimated that 85% of the 800,000 computers in the National Health Service were running on Windows XP. Instead of purchasing licenses for newer versions, the UK government paid Microsoft £5.5 million to extend support for Windows XP until 2015. The US Navy is also stuck with Windows XP until next year as the government has extended support until July 2017, after paying $31 million to Microsoft. BWX Technologies, Inc. announced today that its subsidiary BWXT Nuclear Operations Group, Inc. has received two competitively bid awards (development and fabrication) under a single contract for Virginia Payload Module (VPM) launch tubes. The contract was awarded by General Dynamics Electric Boat to support the Virginia-class submarine program and is worth approximately $35 million. The VPM will comprise four large-diameter payload tubes in a new hull section to be inserted in Virginia-class submarines. Work has already begun for development efforts and qualification of the processes required to manufacture these payload tubes. BWXT expects to complete the development by 2019. Fabrication of a quantity of first-of-a-kind VPM payload tubes will begin in 2017 with delivery of the first tube scheduled in 2019. The fabrication portion of the contract represents 75 percent of the tube production work available at this time. The work will be conducted at BWXT’s Mount Vernon, Ind. manufacturing facility, the same site where launch tubes are being manufactured for Columbia-class (formerly known as Ohio Replacement Program) submarines. The company is in the process of adding approximately 120 new jobs at Mount Vernon to support this and other new manufacturing activities. The Navy released a new fleet plan that calls for 355 ships, outlining a massive increase in the size of its high-end large surface combatant and attack submarine fleets but a modest increase in its planned amphibious ship fleet, according to a Dec. 14 summary of the assessment. “Rather, this is the level that balances an acceptable level of warfighting risk to our equipment and personnel against available resources and achieves a force size that can reasonably achieve success,” according to the summary, which notes it would take a 653-ship force to meet all global requirements with minimal risk. The largest change to the 2014 totals are in the high-end ships classes of attack submarines, large surface combatants – like guided-missile cruisers and destroyers – and aircraft carriers. The new total adds 16 large surface combatants, 18 attack submarines and an additional carrier over the 2014 plan. Since the roll out of the 2014 plan, both Russia and China have adopted a more expansionist stance and accelerated developments of high-end weapons systems – including supersonic anti-ship missiles and more sophisticated anti-submarine warfare platforms and networks. Service officials expressed increased concerns over the last two years and have told USNI News the force from the 2014 FSA would be insufficient to handle the developing threats. There are also political implications for the new number and the timing of the release. The new total comes as Navy Secretary Ray Mabus and Defense Secretary Ash Carter have engaged in a public spat over the direction of the Navy’s shipbuilding program, and as the Trump administration prepares to take office and potentially begin moving towards its stated goal of building a 350-ship Navy. The uptick in large guided-missile ships are to “deliver increased air defense and expeditionary [ballistic missile defense] capacity and provide escorts for the additional aircraft carrier,” reads the summary. Last year, USNI News reported the surface Navy was increasingly concerned with the speed and sophistication of new anti-ship guided missiles emerging from China. Officials worried the service’s assumption of 88 large surface combatants was too low. That total was based on filling a carrier strike group with five guided-missile combatants to perform anti-submarine warfare (ASW), protect the ship from surface and air threats and protect the CSG from ballistic missiles. However, ongoing studies and wargaming conducted by the Navy’s surface warfare establishment concluded the number of ships to keep carrier safe should potentially be increased to seven or eight due to how rapidly the Chinese have increased their high-end capability. What’s unclear from the summary is how the Navy will organize the large surface combatant total. The Navy has struggled with finding both the money and time to modernize the Aegis Combat Systems in its legacy Arleigh Burke-class destroyers to configurations that can simultaneously fight traditional air warfare threats like cruise missiles and fighters as well as ballistic missile threats. Additionally, it remains to be seen if the service will revise its cruiser modernization plan that sidelines some number of the ships, if the service will accelerate a new cruiser replacement program, and if it will accelerate production of the existing class of Arleigh Burke guided-missile destroyers from the current two-a-year pace split between General Dynamics’ Bath Iron Works and Huntington Ingalls’ Ingalls Shipbuilding. A large increase in the attack submarine requirement was expected. Over the past year, the U.S. Pacific Command and U.S. European Command commanders have told Congress that they are only receiving about 60 percent of the SSN presence they request, in a time when Chinese and Russian submarine activity is increasing and anti-ship missile threats are both growing more sophisticated and proliferating. Attack subs may be the best naval tool for early battlefield shaping efforts, were the U.S. Navy to enter into a conflict, and the Navy has plans to make the current Virginia-class attack subs more lethal and stealthier through planned block upgrades. Based on the combatant commanders’ testimony, it would take a fleet of at least 80 SSNs to fill all their requests, which would be unfeasible for the submarine shipbuilding industry – which consists of two yards, General Dynamics’ Electric Boat and Huntington Ingalls’ Newport News Shipbuilding – given the start of construction activities for the new Columbia-class ballistic missile submarine replacement program. Though 66 would not give the combatant commanders everything they want –the Navy acknowledges in the FSA’s executive summary that the service will never be able to build enough to give the combatant commanders’ their full requests – it would go a long way in giving the Navy more options for realistic high-end training with live submarines ahead of carrier strike group deployments, mid-deployment training opportunities at sea and increased presence to counter increased Russian and Chinese presence. The Navy’s new FSA does not make any changes to the service’s requirement for nuclear weapon-carrying ballistic missile submarines. The Navy has 14 Ohio-class SSBNs today and intends to replace them with 12 Columbia-class boats that can provide the same level of presence. The new plan calls for adding one additional aircraft carrier to the Navy’s force structure, bringing the service total to 12. A carrier strike group is among the most in demand assets from the U.S. combatant commanders for its imposing conventional deterrent and its ability for the U.S. to conduct strike operations almost anywhere in the world. The Navy today has 10 and will have 11 when the first-in-class Gerald R. Ford joins the fleet next year, though it will not begin overseas deployments until it finishes a couple years of post-delivery tests, shock trials and maintenance work. The Navy’s 10-carrier fleet has struggled to balance maintenance needs and combatant commander demand. The Navy tried to move to a supply-based deployment model with its Optimized Fleet Response Plan but has still seen carrier deployments extended to avoid gaps in carrier presence in the Middle East and the Pacific. As a result, presence has varied wildly in the last couple years: over the summer the Navy had two carriers in the Mediterranean and two operating together in the Philippine Sea, and yet today only one carrier is in the Mediterranean and none underway in the Pacific. An additional carrier could provide additional overseas presence, but it could also provide a buffer to ease pressure on the force, allowing ships sufficient time for maintenance and training. Only one shipyard, Newport News Shipbuilding, builds aircraft carriers. The yard currently builds the carriers in five-year centers, though the shipyard and its supporting vendor base have argued it would be more efficient to deliver a carrier once every four years. For the Navy to increase its carrier fleet size, it would have to build the ships faster than they are set to decommission, and moving to four-year centers is the most likely way to do that. 31 ships, but not nearly as large an increase as many in the Navy and Marine Corps had hoped for. The Navy and Marine Corps agreed several years ago that it would take 38 amphibious ships – and a particular balance of fixed-wing capable amphibious assault ships (LHDs and LHAs), sophisticated San Antonio-class amphibious transport docks (LPDs) and workhorse dock landing ships (LSDs) – to support a two-Marine Expeditionary Brigade forcible entry operation. They also agreed that despite the need for a two-MEB force, they could not afford 38 ships in the current budget environment, so they would aim for 34 as a budget-constrained figure. Requirements for Marine Corps presence around the world has only increased since that agreement. The service has sent out land-based Special Purpose Marine Air-Ground Task Forces (SP-MAGTFs) to provide presence in Africa, the Middle East and South America. Without ships, though, these forces rely on their MV-22 Ospreys and KC-130J Super Hercules aircraft to move around – and importantly, they rely on the permission of other nations for basing and other support, rather than being self-supported from a U.S. warship at sea. In addition to the SP-MAGTFs, the 3rd Marine Division in the Pacific is located forward in Japan but does not have any ships it can access regularly to for training, partnership-building with local Pacific partners or to respond to a contingency. In total, the Marine Corps has said it would need upwards of 50 amphibious ships to provide the presence around the world it provides today but with proper amphib ship support. The new total also restores the Navy’s old 2012 requirement of 52 smaller surface combatants, which will include the Littoral Combat Ship and frigate programs. Last year – on Dec. 14, 2015 – Carter ordered the Navy to trim the LCS and frigate program to 40 ships from 52 and route the money into higher-end weapon systems. Uniformed officials have continued to say at events and in congressional testimony that, though Carter may have curtailed the small surface combatant program at 40, the warfighting requirement remained at 52. Since the 2015 memo, the LCS program has come under sustained scrutiny from Congress, and the both the Lockheed Martin Freedom-class and the Austal USA Independence-class variants have suffered high-profile engineering failures. In September, the Navy rolled out a new plan that restructured the deployment of both classes of LCS, but given the continued criticism of the program it’s unclear what further changes may need to be made. Also unclear, based on the restored 52-ship requirement, is whether the Navy will transition to the frigate with both or just one LCS hull design. The service originally intended to make frigate upgrades to both the Freedom-variant and Independence-variant designs, adding survivability and lethality and permanently installing both surface warfare and anti-ship warfare equipment rather than using interchangeable mission packages. Carter’s memo last year not only directed the Navy to stop at 40 LCSs and frigates but also instructed the service to downselect to a single vendor for the frigates. The Program Executive Office for LCS told USNI News recently that it crafted its latest request for proposals in a flexible way that would allow the office to buy a range of numbers of LCSs or frigates from either or both yards, depending on what the next administration directs it to do. The FSA calls for the Navy growing its Combat Logistics Force by three ships, its Expeditionary Support Base (formerly called the Afloat Forward Staging Base) by three and its command and support ships by two. The executive summary notes the combat logistics ships are needed to support an additional aircraft carrier and the larger fleet of large surface combatants, which require refueling and resupplying at sea. The increase in command and support ships reflects two additional surveillance ships. The doubling of the ESB fleet comes as only one has joined the fleet but Commandant of the Marine Corps Gen. Robert Neller has said the combatant commanders are already clamoring for more. The Navy converted an LPD set for decommissioning into an interim AFSB in 2012 to support mine countermeasures operations in the Persian Gulf. The resounding success of that deployment led the Navy to convert its Expeditionary Transfer Dock (formerly called the Mobile Landing Dock) design into an ESB that could support mine countermeasures operations, special operations forces and even Marine SP-MAGTF operations. Neller said in February that the first ESB, USNS Lewis B. “Chesty” Puller (T-ESB-3), would deploy to the Middle East but that he wanted a ship like that in the Mediterranean Sea to support the Europe-based SP-MAGTF crisis response force that covers Africa. “I would like very much for that ship to be based in the Med. Right now that’s not the plan, but we’re going to continue to work on that,” he said at a Brookings Institution event. The 3rd Marine Division in the Pacific has also expressed interest in an ESB if it couldn’t get access to amphibious warships, as an alternate means of being able to move its force around the Pacific. Adding three additional ESBs to the plan could help fill these requests for ESBs in the Pacific, Mediterranean and Gulf of Guinea areas. The release of the new set of shipbuilding goals comes as Mabus and Carter are locked in a public fight over shipbuilding priorities. Earlier this month, the Navy submitted its proposed Fiscal Year 2018 budget that included $17 billion in additional spending in open defiance of guidance from Carter, as first reported by Defense News That money would buy surface ships Carter ordered trimmed as well as additional submarine, Defense News reported. In a memo, Mabus chided Carter’s direction. “The instruction your office conveyed directed cuts that would reduce the Navy’s and Marine Corps’ essential role as a forward-deployed and forward-stationed force to a fleet confined to home ports with infrequent overseas deployments,” Mabus wrote in the memo. The timing of this FSA is unusual, since it typically follows the submission of the entire defense department budget to Congress every few years. The release, almost two months ahead of the full budget release to Congress – and several months after the planned Summer 2016 rollout – is thought to be a move from Mabus to cement his shipbuilding legacy over Carter’s objections. It could also support the incoming Trump administration that has called for a battle force total of more than 350 ships. “My budget submission will be the bridge to future budgets that reflects a new Force Structure Assessment and builds the Navy and Marine Corps the nation needs to maintain American influence, assure allies and partners and protect critical pathways of trade and commerce,” Mabus wrote in the December memo. WASHINGTON – The Navy on Friday boosted its projections of how many Virginia-class attack submarines it needs from 48 to 66 – opening the door to boosting production to three subs a year. The Navy’s new Force Structure Assessment, or FSA, would boost the total number of ships and subs to 355, even more than the 350 President–elect Donald Trump has proposed. The FSA provides one more aircraft carrier, 16 additional large surface combatants, four more amphibious warfare ships and five more support ships, as well as the 18 additional attack submarines. But it does not increase the number of the new Columbia-class ballistic missile submarines, that like Virginia-class subs, are built by Electric Boat in Groton. The Navy’s plan would keep the number of Columbia-class subs at 12. “It’s the first time the Navy has taken a new look at submarines since 2004, and it’s long overdue,” he said. Besides boosting the Navy’s capabilities to address emerging threats, Courtney said an increase in the number of submarines would help lessen “stressful deployment” because sailors are out at sea for long periods of time. “It’s having a real impact on people,” he said. Congress would have to fund the additional ships and submarines. It is conducting its own fleet architecture study and considering the possibility of boosting the number of attack subs in the fleet to 66 – and increasing the pace of submarine production from two to three a year. “That’s under serious analysis right now,” Courtney said. In a joint statement, Sens. Richard Blumenthal and Chris Murphy praised the Navy’s move. The report said to fully meet all expected threats, the Navy would need a fleet of 653 ships, doubling it’s budget, “which is unrealistic,” both now and in the future. “Therefore this demand signal had to be balanced against likely future resource levels and risk assessments to provide a achievable force to which the Navy could aspire,” the FSA said. Still, increasing the projected growth of the Navy’s fleet by 47 ships and submarines is going to require a scramble for money and will pit the Navy against the other services that also hope to boost their weapons systems. “There is the larger question of whether the Navy is going to get a larger piece of the pie,” Courtney said. There’s already sparring between the Pentagon and the Navy over the Navy’s budget, which would have to be approved by Congress. The Navy recently submitted a proposed budget for fiscal year 2018 that was billions more than the cap set by Secretary of Defense Ash Carter. The fleet expansion is aimed at responding to the new threats posed by Russia and China, whose naval capabilities have increased dramatically in recent years. “Both Russia and China have advanced their military capabilities and capacities to act as global powers and non-state actors and acquired greater access to advanced technologies that power new threats to our armed forces,” Mabus wrote in a recent memo to Carter. “This national security environment is undeniably more demanding than any we have experienced in the previous two decades, requiring a more capable and ready Marine Corps and a larger Navy Fleet,” the outgoing Navy secretary said. Four Astute class submarines are under construction. The United Kingdom has formally named the Royal Navy’s fourth Astute-class submarine during a ceremony at the BAE Systems shipyard in Barrow-in-Furness. The nuclear submarine was named Audacious. Marking a milestone in the vessel’s journey towards joining the Royal Navy’s fleet, Lady Elizabeth Jones, the wife of First Sea Lord Admiral Sir Philip Jones, formally christened the submarine in the classic tradition of breaking a bottle – on this occasion, a traditionally brewed local beer – on her bow. The naming ceremony of the 7,400 tonne, 97-metre long submarine took place in front of thousands of people, including the BAE Systems’ workforce who have built her and the Royal Navy submariners who will serve on board her. First Sea Lord Admiral Sir Philip Jones said: “Today’s naming ceremony for HMS Audacious adds another world-beating nuclear submarine to the already formidable Astute class. The ceremony took place almost a year to the day since the third Astute submarine, HMS Artful, was officially handed over to the Royal Navy. Audacious will now stay inside the Devonshire Dock Hall in Barrow for final work to be undertaken on her, before being launched next year for testing and commissioning of the boat’s systems. PARIS – Defense minister Jean-Yves Le Drian is due to sign Tuesday an intergovernment agreement with his Australian counterpart, Maryse Payne, on cooperation on the AU$50 billion ($36 billion) Australian Future Submarine Program, Australian defence industry minister Christopher Pyne said. That signing in Adelaide, South Australia, will be “the next milestone” in working with DCNS, the boat builder, and Direction Générale de l’Armement procurement office, Pyne said after giving a Dec. 15 keynote speech to IHEDN, the Institute for Advanced Studies in National Defense, at the war college, here. Pyne added that he and the Australian prime minister would attend the signing and that Australia and France had already signed a security agreement in the week of Dec. 5. The program to build 12 ocean-going, diesel-electric submarines is the single biggest item in the Australian defense budget, he told a lecture theater packed with IHEDN students, officers and industry executives. DCNS will build the diesel-electric boats, with Lockheed Martin supplying the combat integration system. Australia is the only country with which France has agreed to share the Barracuda submarine’s “propulsion system,” Pyne said in an upbeat tone despite his cold. “That makes us very proud France wants to work with us that closely,” he said. The propulsion system refers to the pump jet propulsion on the Barracuda nuclear-powered submarine being built by DCNS for the French Navy, with the first of class dubbed Suffren. Australia will work with DCNS and DGA, while the Australian Submarine Corporation at Osborne, South Australia, has reorganized to work with DCNS, he said. Lockheed’s work as combat systems integrator will allow the Australian submarines to be “continually interoperable” with the U.S., extending a link available on almost all Australian platforms, he said. Picking DCNS to build the boats signals a “deeper relationship for a long-term strategic industrial cooperation” between Australia and France, Pyne said. That alliance includes technology transfer and extends ties between the armed forces that go back 100 years, when troops from Australia and New Zealand fought as allies in World War I.
France has great financial interest in the Pacific, with the exclusive economic zone around its overseas territories in the region, said François Géré, chairman of think tank Institut Français d’Analyse Stratégique. “Australian government has put defense at the forefront of our policy agenda,” said Pyne, adding that his was the first appointment as the nation’s defense industry minister. Canberra chose DCNS as its design partner in view of “capability, quality of the French offer and the assessment that working with DCNS to design and build a regionally superior submarine would best meet Australia’s unique requirements,” he said. Australia has set up a resident project team in Cherbourg, northern France, following the design and mobilization contract signed in September. Pyne, asked about Australia’s policy toward fighter and transport aircraft, assumed France was a partner nation on the F-35 rather than operator of the Dassault Aviation Rafale. Asked about Australia’s plans for space, he said, “space industry is underdone” and Canberra needed to decide its policy. Acquiring new satellites was a potential area of interest. “We are spending a great deal of money on defense and I would be surprised if space didn’t find a way of accessing technology and innovation and capacity to listen to potential opponents,” he said. Adelaide will host the 2017 World Space conference with 4,500 delegates expected. Australia has a “determination to sharpen the edge of our blade” by acquiring weapons, platforms and systems, he said. Australia published two “significant” documents this year, an integrated investment program and a defense industry policy, aimed at delivering new capability. Canberra seeks to offer industry “clarity and certainty” over the next 10 years, with the government planning to invest AU$195 billion to 2025/26, the nation’s largest defense spending, he said. Military spending will reach 2 percent of gross domestic product in 2021. “The transfer of technology and industrial capability to Australia so our defense industry can meet our sovereign capability will be crucial, not just to our security but our prosperity,” he said. The shipbuilding program is based on 54 vessels, comprising 12 offshore patrol vessels, nine frigates, 12 submarines, and 21 Pacific patrol vessels, with as much work as possible in Australia. Pyne met Le Drian, DGA chief Laurent Collet-Billon and foreign minister Jean-Marc Ayrault on his visit. The minister also visited DCNS at Cherbourg, where the company is building the Barracuda. Pyne traveled to Britain prior to his French trip, visiting Rolls-Royce's naval business where he viewed the MT30 gas turbine engine fitted on the Queen Elizabeth aircraft carrier, which is being completed ahead of sea trials next year. The engine has been selected for the new Royal Navy Type 26 frigate being built by BAE Systems, which Australia has shortlisted as a contender for its own frigate program. UK defense minister Michael Fallon and defense procurement minister Harriet Baldwin met Pyne to discuss defense cooperation and fostering innovation, objectives that are at the heart of both Britain and Australia’s national defense policies, the defense ministry said Dec. 13. The ministers also discussed joint operations carried out by the UK and Australia and the partnership the two nations share as members of the Five Power Defense Arrangements and the Five-Eyes Intelligence alliance, the ministry said. As part of the UK-Australia export relationship, the Type 26 Global Combat Ship has been shortlisted for Australia’s Future Frigate program. Pyne also met representatives from the defense ministry, Defense Equipment and Support, and visited Rolls-Royce and BAE. State-owned DCNS, backed by the French government, won the Australian tender with its offer of the planned Barracuda Shortfin 1A, beating rival offers from ThyssenKrupp Marine Systems and Mitsubishi Heavy Industries and Kawasaki Heavy Industries, backed by Tokyo. Thales holds a 35 percent stake in DCNS and is a specialist in sonars. The IHEDN is sending 50 students to Australia in March, part of plans to strengthen French ties. The French ambassador to Australia sat in on Pyne’s wide-ranging speech, which included Australian domestic policy, geopolitics and French-Australian operational ties. With additional reporting by Andrew Chuter in London. North Korea’s ballistic missile-launching submarine appears to have been out to sea recently, a Washington-based think tank says, though it’s unclear whether a test is imminent. The news comes at the end of a year in which the communist nation conducted two underground nuclear tests and a number of missile launches, including three from a sub. Satellite images taken this month of the North’s Sinpo South Shipyard show that netting previously covering the GORAE-class experimental ballistic missile submarine and submersible test barge is missing, said an analysis published Monday by 38 North, a website run by Johns Hopkins University’s School of Advanced International Studies. Equipment and supplies are visible near the vessel, suggesting it had either recently been at sea or was being prepared to head out soon, the website said. The photos also show that a protective berm at the shipyard’s test stand has been finished, allowing the North to test missiles larger than the KN-11 SLBM fired in August. That missile flew about 310 miles but at a high angle, suggesting it could have gone much farther. Construction also may have started on a new ballistic-missile submarine, said the analysis, citing the repeated movement of rail-mounted gantry cranes near construction halls over the past several months, and frequent activity at a storage yard. Asked about the 38 North report, South Korean Joint Chiefs of Staff spokesman Roh Jae Cheon said the military was keeping a close watch on North Korea. “We can’t confirm any details, though we are closely tracking and monitoring their development trends of submarines capable to load SLBMs,” he said, according to a transcript of the media briefing. North Korea has several land-based missiles with a range that puts them in reach of U.S. bases in the region. SLBMs would increase the threat because they’re harder to detect in advance. 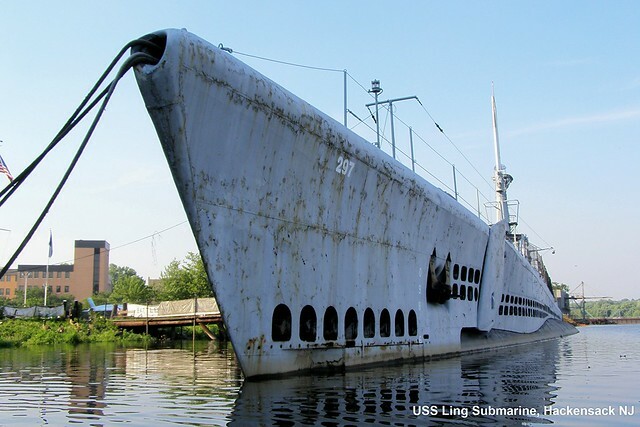 HACKENSACK — The USS Ling has been berthed in the Hackensack River for more than 40 years – and it might be stuck there. The 312-foot, 2,500-ton World War II-era submarine is the featured exhibit of the New Jersey Naval Museum, which occupies a trailer on land that was once the headquarters of the North Jersey Media Group, which was sold to Gannett in July and publishes The Record. The Ling has been anchored off the riverbank behind the newspaper’s former headquarters for decades. Now, however, museum officials are grappling with the logistical and financially daunting challenge of moving the submarine, which by all accounts is mired in muck and is moored in a section of the river too shallow for the sub to navigate. “I don’t know what it would take to get her out of the mud or if that would even be possible,” said Hugh Carola, program director at Hackensack Riverkeeper, an environmental group. Earlier this year, the museum’s lease was terminated by Stephen Borg, former publisher of The Record. Borg, whose grandfather negotiated the 1974 deal to lease land to the museum for $1 a year. The city Planning Board voted in May to subdivide the nearly 20-acre site into four lots for redevelopment, which could include a hotel and 700 residences. On its website, the museum said it would be relocating and that an announcement on the move is pending. The naval museum has been closed since 2012, when Superstorm Sandy washed out the small pier that provided access to the Ling from the riverbank. Since the lease was terminated, the Navy has reclaimed 68 artifacts that it had lent to the museum. Even though the Ling itself is not covered by the lease, these developments have left the submarine’s fate in limbo. Borg said that, as the Ling was not on his property, he had no legal rights over it and would not have a hand in its relocation. Borg said that a meeting to discuss the reclamation and preservation of other museum artifacts – save for the Ling – is tentatively scheduled for early next month. the naval museum, said that all of those options had been discussed and that no decision had been made at this point. In previous interviews, De Laat has said the sub needs at least 17 feet of channel to navigate the river. A June 2015 survey prepared by the U.S. Army Corps of Engineers indicates that the the channel near the Ling is just 10 feet deep. Ed Wrocenski, project manager for the Army Corps survey, explained that the submarine could be mired in sediment that has clumped together over time. The site of both the museum and the Ling is thick with mud and strewn with gnarled vines. The Ling is practically inaccessible. Half of its gangplank washed away in the floods after Superstorm Sandy, and the remaining half is cordoned off. A few lengths of rope connect the submarine to the riverbank. The Ling itself stands high above the waterline. It's riddled with rust holes. One hole in the exterior hull at the stem is a few feet tall. Bill Sheehan, executive director of Hackensack Riverkeeper, explained that when the Ling was originally towed to its berth in 1973, the river was still used to transport construction and industrial materials. The barges that would frequently navigate the river formed a consistent prop wash, a current created by boat propellers that stirred up sediment. “Now that there’s no tugboats coming up this far, the river is becoming less and less passable,” Sheehan said. Colleen O’Rourke, a spokeswoman for the Naval Sea Systems Command, which is responsible for Navy vessels, said the submarine remains the property of the museum. As the Ling’s owner, the museum would have to bear the cost of surveying the river and relocating the sub, she said. The first steps for moving the submarine would be to send out divers to measure the current depth of the river and then send a smaller barge to tow the sub. “Right there, you’re talking a big chunk of money just to find out if it’s deep enough,” Carola said. Carola estimated that the initial survey alone would probably cost several thousand dollars. De Laat had previously estimated that the total cost of the relocation process would be in the millions. Neither the Borg family nor the city is claiming any responsibility for the sub. City officials say they are not able to do anything to save the Ling, either. Once measurements are taken and water channel passage is determined, the submarine would run into obstacles along its journey to a different resting place, Sheehan and Carola said. At the beginning of its trip, the sub would start off fenced in. The submarine is corralled by the Court Street Bridge to the south and the railroad trestle to the north. In August, Mayor Jose “Joey” Torres of Paterson offered to relocate the submarine to the Passaic River, as an exhibit just upstream from the Paterson Great Falls National Historical Park. But relocating it to Paterson may be more difficult than getting the ship out of Hackensack. If the Ling were to be towed to the upstream location proposed by Torres, it would run into the Great Falls – and that’s if it were able to get past the Dundee Dam spanning Clifton and Garfield. Another option could be to dismantle the submarine in Hackensack and reassemble it in Paterson. Carola said dismantling the sub seemed to be the only viable option, though the rust damage on the hull would require bracing for any dry docking. Sheehan had suggested dismantling the Ling after photographing and creating a record of the sub and its history. He did not, however, think rebuilding the sub on land was a viable option. Ls Altschuler, vice president of the Submarine Memorial Association, which runs the naval museum, said there were ongoing discussions regarding the Ling, the museum and the association. But he would not provide any details about the museum’s plans to relocate. Borg said he would be willing to offer financial assistance to the museum for the relocation of the artifacts with the exception of the Ling. All of this has saddened visitors and other supporters of the Ling, which, in its prime, was the site of Pearl Harbor Day commemorations and other remembrance ceremonies. Al Parisi, a writer and historian for the Army Air Forces Historical Association, was a regular at those events. He visited the sub Dec. 7. The U.S. Navy awarded BAE Systems a $368 million five-year contract to provide systems engineering and support services to the service's Strategic Systems Programs (SSP) office, which covers strategic and attack weapons systems on U.S. and U.K. ballistic missile submarines (SSBNs), the company said Wednesday. SSP specifically overseas the Strategic Weapons System and Attack Weapons System on board current U.S. Ohio-class and UK Vanguard-class submarines, in addition to the future Ohio replacement and the UK Dreadnought-class of submarines. These are nuclear-powered ballistic missile submarines that are capable of delivering the nuclear -armed Trident II D-5 submarine-launched ballistic missile (SLBM) from both Ohio and Vanguard-class vessels. BAE employees under the contract will continue to support weapons systems integration and provide test engineering services and special test equipment for SSP. The company team will also provide IT support, develop fleet documentation materials, assist with training programs, conduct facility maintenance monitoring, and offer nuclear and conventional weapons safety support. "We provide expertise to the Navy to maintain, optimize, and deploy seaborne weapons systems that serve as a strategic deterrent against major threats to the security of our nation and its allies," DeEtte Gray, president of BAE Systems' intelligence and security company sector, said in a statement. First will be named Columbia after the nation's capital; Earl Warren and Puerto Rico to follow. WASHINGTON – During a ceremony Dec. 14 at the District of Columbia city hall, Secretary of the Navy Ray Mabus formally announced the first ship of the new fleet ballistic missile submarines (SSBN), formerly known as the Ohio-class replacement, will be named USS Columbia (SSBN 826) in honor of the District of Columbia. Ballistic missile submarines are critical, stabilizing and efficient elements of the U.S. nuclear deterrence and assurance policy, carrying the majority of deployed U.S. nuclear warheads. Columbia-class SSBNs incorporate advanced technology and will provide the most survivable leg of the Nation's strategic triad. Mabus also announced that the next ship in the John-Lewis class of fleet replenishment oilers, named in honor of U.S. civil rights heroes, will be named USNS Earl Warren (T-AO 207). The future USNS Earl Warren will be operated by Military Sealift Command and provide underway replenishment of fuel and stores to U.S. Navy ships at sea and jet fuel for aircraft assigned to aircraft carriers. Construction is expected to begin on the Earl Warren in 2019. Born in 1891 in Los Angeles, Earl Warren served in the military during WWI and later became a county district attorney. He won election to his home state's governorship, holding that position from 1943 until 1953, and was then appointed chief justice of the U.S. Supreme Court. Warren led the Court through many landmark cases dealing with race, justice, and representation. He is credited with helping end school segregation with the court's decision in Brown v. Board of Education in 1954, stating "in the field of public education, the doctrine of 'separate but equal' has no place. Separate educational facilities are inherently unequal." The final ship named during the ceremony was the future USNS Puerto Rico (T-EPF 11). The Expeditionary Fast Transport (EPF), formerly named the Joint High Speed Vessel (JHSV), is a shallow draft, all aluminum, commercial-based catamaran that is designed for High Speed Intra-Theater Surface Lift and serves in a variety of roles for the military branches to include support of overseas contingency operations, conducting humanitarian assistance and disaster relief missions and supporting special operations forces. Austal USA in Mobile, Alabama, will build the new EPF, which will be 338 feet in length, have a waterline beam of 93.5 feet, displace approximately 2,362 tons and operate at speeds of approximately 35+ knots. Vessel was cut in half while operating in North Korean sea. North Korean submarine was cut in half in an accident whose cause is unknown, with all of its 12 crew members killed. The Japanese daily Tokyo Shimbun quoted North Korean sources and intelligence authorities in neighboring countries as saying that a North Korean military submarine was cut in half in April while navigating under North Korean waters. What caused the accident was not known, according to the report. North Korea’s state-run media have never reported on the incident. The bereaved families of the crew were informed of the submarine disaster weeks after it happened through local village heads. The North Korean government gave “hero” titles to the crew and new homes to their bereaved families. According to the Japanese daily, the youngest victim was a 19-year-old man, whose mother was witnessed wailing very loudly upon hearing the news of her son’s fate. Later in the same month, North Korean media hyped about a “successful” missile launch from a submarine under waters off Sinpo, South Hamgyong Province. North Korean leader Kim Jong Un observed the submarine missile launch and expressed his satisfaction with the result, saying, "We are now capable of hitting the heads of the South Korean puppet forces and the U.S. imperialists anytime as we please.” A North Korean expert told the Japanese daily that the lives of the North Korean people are “like dust” to Kim Jong Un and that nuclear weapons are much more important to him. The newspaper also cited multiple sources on North Korea as saying that Kim told a meeting of the ruling Workers' Party of Korea’s Central Military Commission meeting held after the fifth nuclear test in September that upgrading Pyongyang’s nuclear weapons was an “important project” to make the United States understand the North as a nuclear-possessing state. Analysts say the country is too dependent on foreign suppliers. Indonesia is developing its own unmanned underwater vehicle (UUV) in a bid to enhance its maritime security, but experts say it faces major challenges in the developmental stage and may not make a big difference even if it is in service. The indigenous submarine platform, known as the Kaledupa, boasts modern underwater sensors and has an operating depth of 150m, the Jakarta Post reported on Wednesday. It was tested in waters off Sulawesi on Sunday. Brigadier-General Jan Pieter Ate, director of defence industry and technology at the Indonesia Defence Ministry, told the Post that “during the test, (the) Kaledupa managed to prove all of its advantages. We hope this new technological development will reduce our dependency on foreign weapon systems”. To develop and operate UUVs effectively requires a technological base more commonly found in highly advanced countries. Given Indonesia’s low defence industrial base, it remains to be seen if the Kaledupa project would be viable. Naval expert Collin Koh told TODAY that the initiative is feasible in theory at least, given that it could utilise a wide variety of commercially available dual-use technologies. However, the research fellow with the Maritime Security Programme at the S Rajaratnam School of International Studies (RSIS) added: “What remains to be seen is whether the Indonesian government will sustain the funding for this project until the system reaches full operational capability and is put into broader naval service. “From what I understand, despite repeated calls for the Indonesian military to obtain more locally made products, there’s still a preference for foreign designs in many cases. Defence analyst Richard Bitzinger is even more guarded in his assessment of the Kaledupa programme. He noted that developing indigenous defence technology requires reaching out to foreign firms and this would complicate the developmental process. “That, in turn, raises issues of technology transfer as the more sophisticated the technology, the greater the restrictions that are likely to be applied to such transfers,” explained Mr Bitzinger, who is the coordinator of the Military Transformations Programme at RSIS. In view of the challenges faced in developing an indigenous UUV, Mr Bitzinger envisaged a “steep learning curve” for the Indonesians. If Jakarta does manage to overcome this steep learning curve, would the Kaledupa make any difference operationally? For one, what is known about the platform certainly does not amount to a breakthrough. After all, its quoted operating depth of 150m is just half of what some Western UUVs are capable of, Dr Koh observed. Moreover, Mr Bitzinger cautioned that based on current technology, the use of UUVs for naval missions such as mine-hunting and undersea surveillance is generally quite limited. And although Dr Koh noted that UUVs mated with submarines would “extend the capabilities of navies and allow more discreet intelligence-gathering missions, putting crews out of harm’s way”, this in itsself is a major technical and operational challenge that the Indonesian navy would have to overcome. How Will Australia’s $50 Billion Submarine Investment Stack Up? 12 new submarines hardly compares to what other regional powers have. Australia is spending $50 billion over 30 years on 12 new submarines to upgrade our ageing fleet. The move has been described as critical to make the country “regionally superior” in terms of its maritime ability and signal to President-elect Donald Trump Australia is no “strategic bludger” when it comes to Defence commitments. But how do we stack up when it comes to other countries and their military hardware? Not very well, according to this list compiled by Global Firepower. It ranks Australia 17th when it comes to the list of submarines by country. The US is number one with 75, while North Korea reportedly has 70. China is thought to have 68 while Russia has 60 and Iran has 33. Japan is thought to have 17 while South Korea has 15. India has 14, Turkey 13 and 11 each for Greece and Colombia, with 10 each for France and the UK. At present, Australia has six of the Collins Class submarine. The new additions will come over 30 years and it’s not known what the total number will be in service at any given point in future. Countries usually work on a ratio of 4- or 5-to-1 in terms of submarines that are able to be active versus those that are out of the water for maintenance or modification. Australia currently has six, with 12 more on the way. The new Australian designs will come from French company DCNS, with a $1.5 billion weapons system from Lockheed Martin. They will be built in Adelaide at shipyard facility that will be upgraded to resemble the military-style headquarters of DCNS in Cherbourg, France. The Australian Defence Force argues submarines are critical for a country like Australia with a vast coastline and strategic interests in preserving the “rules-based international order” in the region. Ninety-nine per cent of Australian exports are by sea and maintaining clear passage is an economic necessity for the country. This week, Australian Defence Industry Minister Christopher Pyne visited DCNS in France and spoke about the close relationship between the two countries. He said he was “not concerned” about the “industrial espionage” that saw a subcontractor steal 22000 files relating to an Indian submarine design and leak them to a staffer of Nick Xenophon because they related to a different class of submarine. He also said the new design would be the “most potent weapon” in Australia’s armaments. “We have a wealthy country and as a consequence we have a responsibility to do our part, as Donald Trump says, not be strategic bludgers but actually lift our percentage of spending to two per cent, which we’ll do by 2020/21,” he said. PARIS – DCNS Group has begun M51 missile adaptation work for the last of three French ballistic nuclear submarines scheduled for the upgrade. Work on the final submarine in the program, known as Le Téméraire, is set to continue for the next 18 months. The France-based defense contractor says the tasks will include extensive refit maintenance operations. "This complex project illustrates the expertise of DCNS, as prime contractor and project supervisor. In addition to our own teams on the sites in Brest, Ruelle and elsewhere, we are coordinating the work of some 45 companies in the region around Brest and the West of France that have been called upon to carry out with us the 4 million hours of work required by the overhaul, all in compliance with our safety, deadlines and quality of work specifications," program manager Michel Drévillon said in a press release. The M51 is a submarine-launched ballistic missile built by Airbus Defense and Space used by the French Navy since September 2010. Each of the missiles are capable of carrying six to ten independently targetable TN 75 thermonuclear warheads. In addition to the adaptation, the maintenance work also includes upgrades for the vessels' navigation and combat systems. Seoul South Korea on Wednesday kicked off a project to build a 3,000-ton submarine equipped with ballistic missiles, the state arms procurement agency said, reported Yonhap. The third vessel of the Chang Bogo-III batch 1 ships is part of the country's three-stage plan to make a total of nine subs with indigenous technology by 2027 to strengthen its maritime capacity against growing threats from North Korea. Officials from the Defense Acquisition Program Administration (DAPA) discussed details of the project on the day during a meeting with its manufacturer Hyundai Heavy Industries Co. The French naval defense firm DCNS has proposed a modified design of its diesel-electric Scorpene attack submarine as a possible option to replace the Norwegian Navy's in-service Ula-class submarines. DCNS, in collaboration with Thales and FSI, has organized an Industry Day in Oslo, on 6 December, for consolidating its industrial cooperation proposal to Norway in the frame of new Submarine program. The French-Norwegian event is aimed at strengthening and consolidating the industrial long term cooperation between both Industries. DCNS was shortlisted as one of the two potential candidates for the replacement of Ula-class submarine fleet in April 2016. The organization of thematic workshops has been the occasion to focus on technological partnerships around specific projects and technical areas. Those following working meetings are part of the Industrial Cooperation Plan process and a key step to reach the signature of fruitful partnerships between French and Norwegian companies in 2017, in continuation of the intense networking that started in 2016. Australia and France concluded a bilateral agreement to share classified information on defense programs including sensitive defense technologies related to Australia’s SEA 1000 Future Submarine Program, the office of the Attorney General for Australia announced in a press release last month. The agreement signed by Australia’s Attorney-General, George Brandis, and French Minister of Defense, Mr Jean Yves Le Drian, aims to “improve sharing of classified information between the two countries and strengthen existing protections,” according to the press release. •Allocating responsibility between the parties where contractors are engaged in projects that involve classified information. As I reported elsewhere (See: “Australia Warns French Submarine Maker After Massive Security Leak”), French shipbuilder Direction des Constructions Navales Services (DCNS) has a won a bid to engage in exclusive negotiations over the construction of 12 Shortfin Barracuda Block 1A subs, a diesel-electric derivative of DCNS’ Barracuda-class nuclear attack submarine, for the Royal Australian Navy (RAN). “Australian Prime Minister Malcolm Turnbull announced in April that DCNS has won the competitive evaluation process for the design and construction of the RAN’s next-generation submarines. The estimated cost for Australia’s new fleet of submarines is A$50 billion ($38.13 billion)—the country’s largest defense deal in history,” I explained in August 2016. Australia and France are currently engaged in negotiating the details of the defense contract including construction schedules and technology transfer agreements. Negotiations between DCNS and the Australian government came under intense public scrutiny after the former suffered a massive leak of documents detailing the top-secret combat capabilities of the Indian Navy’s Scorpene-class (Kalvari-class) diesel-electric attack submarine, which DCNS has been building with the support of India’s state-run Mazgaon Docks Limited (MDL) in Mumbai for the past decade (See: “Top Secret Data on India’s New Stealth Attack Submarine Leaked”). defense contractor that Australia expects the same level of security as U.S. defense contractors considering that the RAN’s Collins-class subs are fitted with a U.S.-made combat system. As a consequence, DCNS Australia announced on August 26 that it will establish an operational Security Committee by the end of 2016. The recently signed classified information sharing treaty is the next step in the burgeoning Australian-French defense partnership. “This intergovernmental agreement constitutes a significant milestone in the development of a strategic partnership between France and Australia,” according to the press release. Indonesia is developing unmanned submarine technology in the hope of securing the country’s vast ocean territory at an efficient cost. The unmanned submarine, called Kaledupa, will be able to operate at a depth 150 meters, the Defense Ministry’s director for defense industry and technology, Brig. Gen. Jan Pieter Ate, said on Tuesday. The product is made by PT Robo Marine Indonesia, a technology company based in Bandung, West Java. “The Defense Ministry has ordered the defense industry to develop the technology for this unmanned submarine. We have appointed PT Robo Marine Indonesia because the company has skills in this technology,” Jan Pieter told The Jakarta Post. Kaledupa was tested on Sunday in Wakatobi waters, Southeast Sulawesi, to obtain the ministry’s certificate of eligibility. Jan Pieter said Kaledupa had many strengths. For instance, it has underwater sensing technology, an underwater recorder with HD resolution and LED lighting tools that help the submarine see hundreds of meters under the ocean. “During the test, Kaledupa managed to prove all of its advantages. We hope this new technological development will reduce our dependency on foreign weaponry systems,” he said. Excessive secrecy imposed on the first contract in Adelaide’s $50 billion submarine project will prevent measurement of job and business benefits, says influential Senator Nick Xenophon. Threatening court action over a federal blackout of key contract sections, Senator Xenophon said this secrecy would prevent the public understanding what they were paying for and when to expect the finished product. A redacted version of the $500 million submarine design and mobilisation contract, signed on September 30, has been tabled in Federal Parliament by Defence Minister Marise Payne. “It’s simply not good enough that the government is claiming secrecy on material that’s clearly in the public interest to disclose,” Senator Xenophon told The Advertiser. Senator Xenophon is vowing to take court action, if necessary, to force release of more details on contract measures including top-level price, schedule details, intellectual property and Australian industry involvement. Australian Strategic Policy Institute defence and strategy program director Andrew Davies said defence acquisition was lamentably opaque and it was no surprise even high-level elements of the contract were kept secret. “As it is, it’s very hard to hold governments or officials to account due to the paucity of information we have. The US does it so much better,” Dr Davies said. An agreement to improve sharing of classified information between Australia and France was signed on Friday, aiming to support the future submarine program delivery and other national security matters. It includes mutual recognition of personnel and facility security clearances — essential when people from both countries will be operating at top-secret naval shipyards. Defence Minister Marise Payne, in a letter attached to the tabled contract, says some aspects would be inappropriate to disclose publicly because they might disadvantage submarine designer and builder DCNS and help its business competitors. “Given the role of DCNS in delivering French national submarine programs, such disclosure could reasonably be expected to also damage international relations with France,” Senator Payne says. Some fee and pricing structures contain information that reveals DCNS’s cost structure and profit rates, she says. Meanwhile, the Adelaide-built air warfare destroyers will be maintained by BAE Systems Australia under a five-year, $70 million contract announced by Defence Industry Minister Christopher Pyne. This will provide about 50 fulltime jobs in Sydney. The French ballistic nuclear submarine (SSBN) Le Téméraire has been transferred from Île Longue to Dock 8 of the naval base in Brest for scheduled maintenance and major modification work to prepare the submarine for the new M51 strategic missile. Le Téméraire is the last of the three French SSBNs to receive the upgrade, for which DCNS is the prime contractor. For the next 18 months, DCNS teams will be carrying out the adaptation work for the M51 ballistic missile, along with the extensive refit maintenance operations involved in the vessel’s scheduled major technical shutdown. In addition to the complete maintenance programme, carried out every 9 years on this class of submarine, and the adaptation to accommodate the new M51 missile, the navigation and combat systems will be upgraded. Because of their size (138m long, 12,500t), cutting-edge technologies, and the constraints relating to their use in operations, these submarines are among the most complex systems produced in the world. Around 45 companies in the region around Brest and the West of France will contribute to the 4 million hours of work required for the overhaul. DCNS aims to complete the full programme in one month less than for the previous SSBN, Le Triomphant. The U.S. Navy is looking to expand the web of connections currently linking its ships, planes and weapons to include submarines, smaller ships and unmanned systems to create a warfighting network that would be challenging for an adversary to bring down, the Navy’s surface warfare director (OPNAV N96) said. Rear Adm. Ronald Boxall said that the Navy is comfortable with its Aegis Combat System and the Naval Integrated Fire Control-Counter Air (NIFC-CA) construct built around it, but that the service would have to expand this idea to keep up with global threats. “Unfortunately we’ve had a little bit of a glass ceiling at the ship level, and until we get to the system level and get that across all platforms, that’s the challenge,” he said of Aegis, while speaking at the American Society of Naval Engineer’s annual Combat System Symposium. This means bringing in submarines, small ships like the Littoral Combat Ship or even the Mk VI patrol boat, and unmanned boats, along with new aircraft and sensors. NIFC-CA traditionally connects a ship with the Aegis Combat System, an E-2D Advanced Hawkeye airborne early warning aircraft and weapons like the Standard Missile (SM) family of weapons. Boxall told USNI News after his presentation that the addition of the over-the-horizon missile to the LCS is exciting because it helps extend the reach of the LCS ships individually and helps them take a more aggressive offensive posture, but it also fits in with this idea of a more netted Navy. With the addition of over-the-horizon firing, “now you have that capability on a small ship, we’ve got to be able to make sure we can command and control and stay with it, so the network becomes part of that. So a sensor which can support that ship and that weapon needs to be good enough to keep that network robust, and so if we lose one sensor we have a way to back it up,” he said. One way to add redundancy and increase the robustness of this capability is to net the LCS, its MH-60R helicopter as the sensor, and the missile itself into other naval networks. “Right now LCS is not a NIFC-CA-capable platform, but the concept that we use for NIFC-CA could be, whether we look at future unmanned air or even using existing helicopters that we have,” Boxall said. Additionally, Boxall said in his speech that the LCS’s upcoming anti-submarine warfare mission package, with its highly capable variable-depth sonar and multi-function towed array acoustic receiver, could be a great asset for submarines and aircraft like the P-8A Poseidon maritime surveillance plane to leverage if they could all pass information between platforms run by different program offices, paid for by different resource sponsors and employed by different commanders. Boxall stressed that the Navy is moving towards a cross-domain warfare approach that would remove some stovepipes that separate these platforms, with the idea that a netted Navy is a stronger Navy against any adversary that would seek to disrupt one node in the network. During his speech he said that budget constraints mean the Navy needs to determine what jobs can be done by smaller and less expensive ships, and which jobs are reserved for larger and more high-end ships, and conduct these missions in the most cost-effective manner possible. “On the low end, I just talked about MDUSV (the Sea Hunter medium displacement unmanned surface vehicle), that type of vessel – maybe it’s Mk IVs, maybe it’s LCS. What we’re doing with different sized platforms, I want them to be as small as they can be but do everything they need to do,” he continued, adding that the surface warfare community is even looking at making some small boats unmanned to further reduce their cost. Boxall said during his speech that the increasing range of potential adversaries’ weapons have forced the U.S. Navy into a more defensive posture, and the efforts to field longer-range missiles and create this netted Navy are an effort to regain an offensive posture. capable of operating today, in less than two years from inception,” as an anti-air and anti-ship weapon. The Tomahawk land-attack missile will also get an anti-ship capability as the missiles are refurbished and upgraded. Overall, “it gives us two types of missiles in one cell. So as you get out there and you have VLS (Vertical Launching System) capability out there, we can put SM-6 with dual capability, surface-to-air and surface-to-surface, and same with Tomahawk, land attack and also anti-ship. That type of synergy, that dual-tasking is a force multiplier for us,” Boxall said. Egypt is due to receive its first Type-209/1400 submarine from Germany at a ceremony in the German city of Kiel on Monday. The Egyptian navy is set to receive several Type-209 submarines from Germany according to an agreed timeline, said an Egyptian military spokesman. Egypt signed a deal with Berlin to buy two German-made Type-209 submarines in 2011, ordering two more in 2014. The new submarine, manufactured by the German company ThyssenKrupp Marine Systems, is a technological addition to Egypt's navy and will further its capability to bolster Egyptian national security, said the spokesman. USSR's first-ever nuclear-powered submarine K-3 Leninsky Komsomol is to be launched in February 2017, Flotprom reports. The sub is said to be used as a museum. The works to finish the submarine are currently conducted at Nerpa shipyard. The place, where the submarine will be located after launch, has not been determined yet. Earlier, it was reported that the K-3 submarine could remain in the Arctic region as part of the Museum of the Northern Fleet and the Central Naval Museum. A few years ago, it was reported that the Leninsky Komsomol nuclear submarine was going to be decommissioned. As submariners say, the K-3 was going to be shredded for needles. The Leninsky Komsomol was a landmark submarine in the development of Soviet and Russian Navy. The construction of the submarine was started on September 24, 1955 in Severodvinsk. Its reactors were launched in September 1957, and the submarine was launched on October 9, 1957. In 1961, the submarine was carrying its first combat duty in the Atlantic Ocean. In July 1962, the submarine, for the first time in the history of the Soviet Navy, traveled underneath the ice of the Arctic Ocean, passing the North Pole twice. On September 8, 1967, a fire occurred in the first and second compartments of the sub during a combat duty in the Norwegian Sea, killing 39 people. The submarine returned to the base. In 1991, the K-3 Leninsky Komsomol was withdrawn from the fleet. Defense and finance subcommittee votes to buy submarines, missile boats from ThyssenKrupp, despite controversy surrounding Netanyahu associates and the German firm. A Knesset subcommittee voted last week to approve funding for the purchase of new vessels from the German company ThyssenKrupp, even though the police are currently investigating two different aspects of these deals for possible improprieties. The subcommittee on the defense budget – a joint subcommittee of the Knesset’s Finance Committee and Foreign Affairs and Defense Committee – met last Thursday to discuss the proposed defense budget for 2017. Both Defense Minister Avigdor Lieberman and Israel Defense Forces Chief of Staff Lt. Gen. Gadi Eisenkot attended the first part of the meeting. After they left, the panel began voting on the budget’s various items. When the subcommittee got to the navy’s budget, MK Erel Margalit (Zionist Union) and his colleagues in the opposition demanded that the budget for buying new vessels from ThyssenKrupp be frozen. The vessels in question include both submarines and missile boats. The latter, which are meant to protect Israel’s offshore natural gas fields, will cost some 430 million euros ($454 million), of which 115 million euros is coming from the German government. Police are currently looking into two potentially criminal aspects of these deals. One is the involvement of lawyer David Shimron, given his prima facie conflict of interests: In addition to being Prime Minister Benjamin Netanyahu’s personal attorney, he also does legal work for ThyssenKrupp’s Israeli representative. The second regards suspicions that Avriel Bar-Yosef – who spearheaded the purchase of the missile boats and negotiations with Germany over them in his capacity as then-deputy head of the National Security Council – received bribes from a German businessman, Michael Herzog. During the subcommittee meeting, which was closed to the public, opposition MKs argued that financing for the ThyssenKrupp deals should be frozen until the police finish examining the issues. Instead, they said, the money should be put into the Defense Ministry’s budgetary reserve, to ensure that it will still be available if and when the cloud of suspicion is lifted. “It’s inconceivable that foreign parties should turn a profit on defense deals while members of the budget committee don’t even know about them before those billions are approved, and especially when police are investigating the deal,” a source on the committee quoted Margalit as saying. But governing coalition members objected, saying this would be tantamount to reopening the defense budget, which they weren’t willing to countenance. In the end, the motion fell by one vote. The votes in favor of the motion came from Margalit and two of his party colleagues, Shelly Yacimovich and Manuel Trajtenberg. The votes against came from Avi Dichter and Anat Berko (Likud), Moshe Gafni (United Torah Judaism) and Moti Yogev (Habayit Hayehudi). This week, America remembers the 75th anniversary of the attack on Pearl Harbor. This remembrance is particularly meaningful to the U.S. Navy, and even more to Sailors serving at Pearl Harbor. But it should have the greatest significance to the Submarine Force, because it was our contributions to the Second World War that suggest that December 7th, 1941, was actually the day that Imperial Japan won a battle, but lost the war. Submariners are well-aware that World War II provided some of our greatest challenges, our greatest successes, our greatest heroes, and also our greatest sacrifices. And here in Pearl Harbor, we can stand atop the Dive Tower on the Submarine Base and actually see the most visceral reminders of the complete cycle of the war: its opening salvo, the seeds of our eventual victory, and even the war’s conclusion. That makes Pearl Harbor unique – where else in the world is there such a singular vantage point for the breadth of such a major conflict? Sweeping to the left of the Arizona from the Dive Tower, those caissons now bracket the most powerful symbol of the war’s conclusion: the battleship USS Missouri. Today, we can visit the very place on board that ship where in September 1945 the peace treaty was signed that ended the war. That signing ceremony marked both a beginning and an end. As an end, it meant that the war had been won. But it also marked the beginning of the equally important challenge of how to win the peace. And as a result of having won the peace, the United States of America and our former adversary of Japan are now close friends, partners and allies – committed to each other’s success, to each other’s defense, and to promoting freedom and democracy throughout the Pacific. So the USS Arizona reminds us of the start of the war, and USS Missouri reminds us of the end of the war, but the reminders of how the war was won are also visible from the Dive Tower. Although the results of December 7th were horrific, they did not prevent us from prevailing. There were three significant targets that were not struck, and the omission of the fuel farm, the shipyard and the submarine base had strategic consequence. From the Dive Tower, we can see some of the many fuel tanks that supplied the fleet. Adm. Nimitz observed that had these tanks been struck, and their four million barrels of fuel lost, it would have taken two years to replenish our supply such that the fleet could prosecute the war across the vast, vast reaches of the Pacific Ocean. From here, we can also see the dry docks and the incredible industrial capacity of the Navy’s “No Ka Oi” shipyard, the Pearl Harbor Naval Shipyard. After the attack, 12 ships including five battleships had been sunk or beached and nine ships including three more battleships had been damaged. Yet within only three months, most of the smaller ships and all three of the damaged battleships were returned to service or refloated, and all of them eventually returned to the fight in the Pacific. Lastly, Pearl Harbor submarines and the Submarine Base weren’t struck. Within hours of the attack, Chief of Naval Operations Adm. Harold Stark ordered, “EXECUTE AGAINST JAPAN UNRESTRICTED AIR AND SUBMARINE WARFARE;” our submarines were the only forces able to immediately begin war patrols. They carried the battle across the Pacific and into Japanese home waters while the fleet was repaired. Our submariners did their deadly business very well. Although submarines made up only two percent of our entire Navy, they sank 30 percent of all Japanese warships, and 55 percent of all Japanese merchant ships sunk during the war. But submariners also paid the heavy price of the heaviest casualty rate of any American branch of service in the war: 52 submarines were lost, and 3,628 submariners (22% of the force) remain on eternal patrol. The Pearl Harbor horizon has many memorials containing much history, but this important story of submarine force success and sacrifice is hard to find within the Pearl Harbor narrative already on display. Until now. Today, we begin to share that story – honoring our heroes and educating the public – with a new display located in front of the USS Bowfin Memorial, free and accessible to anyone visiting Pearl Harbor’s iconic landmarks. It’s important to remember though that the history of our submarine force didn’t begin on Dec. 7th, 1941; and the submarine force’s significant contributions to our nation’s security didn’t end in September 1945. Throughout the hostile peace of the Cold War, our strategic forces proved undetectable and invulnerable to threats, while our attack submarines demonstrated the ability to hold at risk what other nations’ hold most dear. And strategic deterrence and undersea superiority are just as important to our national security today as they have been in the past. Navy and our Nation should expect no less. So although the history of our submarine force is impressive and is to be celebrated, that history is not complete. Our history is being made today, and every day, by every one of today’s submariners. Because throughout the 116-year history of the U.S. Submarine Force, the most important factor in all of our many successes and in all of our nation’s conflicts has been the submarine Sailor. It is our submarine Sailors, supported by our families, then as now, that are our greatest asset; our secret sauce; our competitive advantage. They are the envy of every would-be competitor on the high seas – or below them. USS BOWFIN SUBMARINE MUSEUM AND PARK—Commander, Submarine Force, U.S. Pacific Fleet, Rear Adm. Frederick “Fritz” J. Roegge, in partnership with Chuck Merkel, executive director of the USS Bowfin Submarine Museum and Park, unveiled a new submarine exhibit in honor of the 75th commemoration of the attack on Pearl Harbor at the USS Bowfin Submarine Museum and Park, Dec. 6. Roegge spoke to more than 150 guests, military and civilian, about the importance of the submarine force during World War II. He explained that while the submarine forces made up only two percent of our entire Navy, they sank 30% of all Japanese warships, and 55% of all Japanese merchant ships sunk during the war. Today, we begin to share that story – honoring our heroes – with a new display located in front of the USS Bowfin Submarine Museum and Park, free and accessible to anyone visiting Pearl Harbor’s iconic landmarks.